Chocolate mousse, an iconic French dessert. Photo by Pink Candy | Dreamstime. 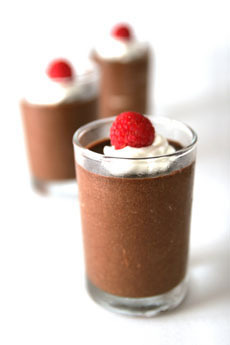 CAPSULE REPORT: Chocolate mousse is a favorite dessert that’s easy to make. This article includes the history and definition of mousse, as well as Julia Child’s chocolate mousse recipe, annotated and enhanced by THE NIBBLE’s founder. This is Page 1 of a three-page article, including valuable presentation and garnishing tips. Click on the black links below to visit other pages. The base or principal flavoring agent: chocolate, passionfruit, chicken liver, salmon, etc. The binder: egg whites and/or gelatin. The lightening agent (aerator)—the component that gives mousse its light, airy texture—beaten egg whites or whipped cream. Some savory mousse recipes (chicken liver, seafood, vegetable) use gelatin as a binder when eggs alone don’t suffice, but this makes the consistency heavier. Other recipes include butter. As with soufflés, mousse can be both sweet or savory, hot and cold and in individual portions or served from a larger dish. Dessert mousse is typically served cold, and savory mousse hot, although sweet mousse recipes (chestnut mousse or cranberry mousse, for example) can be served hot with a hot main course. Note that sometimes mousse is served in an individual ceramic pots, as is a different recipe called pot de crème. The latter is a thick pudding rather than an airy mousse. The exact debut of chocolate mousse in France is unknown. Chocolate, which was brought to Spain from Mexico by the Conquistadors in 1529, arrived in France with the marriage of the Spanish princess Anne of Austria to Louis XIII, in 1615. At that point chocolate was only a hot beverage, but no doubt before long, the creative French chefs at the palace began to experiment with chocolate. However, chocolate mousse was still more than two centuries away. According to FoodTimeline.com, savory mousse dishes were an 18th century French achievement, dessert mousses (generally fruit mousses) began to appear much later, in the second half of the 19th century. Some cookbooks from as early as 1758 have recipes for “frozen mousses,” but this was more like ice cream than mousse as we know it. Chocolate mousse came into the public eye in the U.S. in the 1930s, about the time as chocolate pudding mixes were introduced. While fruit flavors of mousse developed, it apparently took until 1977, at the highly innovative New York City restaurant, The Palace, for Chef Michel Fitoussi to create white chocolate mousse. There are printed citations of mousse that date back to 1892; and in 1892 the Boston Daily Globe published one of the first recipes for chocolate mousse. However, these were for a chocolate pudding-type dish, instead what we now know as airy mousse. In fact, mousse as we know it was abetted by electric mixers that debuted in the 1930s and made it easier to whipping the egg whites to the consistency that created modern mousse. The recipe grew in popularity with the post-World War II growth of French cuisine, and the arrival on these shores of French chefs to spearhead fine restaurants.